Kikuchi Jinja, established in 1870 by order of Emperor Meiji, enshrines several members of the Kikuchi Clan who were known for their bold service in defense of the Japanese Emperor especially during the 13th and 14th centuries. The shrine grounds have a bust, erected in 1969, of Commander Keiu Matsuo, one of the six midget submarine crewmen who died in the attack by three two-man midget submarines at Sydney Harbour in 1942. Navy Commander Keiu Matsuo was born in Mitama (now part of Yamaga City) as the second son of his father Tsuruhiko and his mother Matsue. After attending Kamoto Junior High School while growing up, he entered the Navy. He graduated from the Naval Academy, and he was appointed a Navy Lieutenant in 1942. 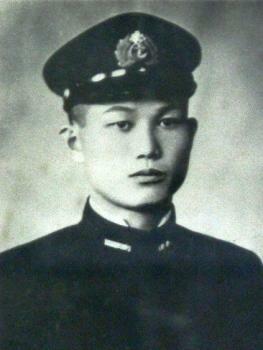 Resolved to die for his country in a time of national crisis during the Greater East Asia War, he piloted a special (midget) submarine together with Senior Chief Petty Officer Tsuzuku on May 31 of the same year. Together with their comrades they made an underwater attack at Sydney Harbour and distinguished themselves in battle as they sacrificed their lives in a national crisis. The enemy's Rear Admiral Gould praised their courage and held a naval funeral for them. He called for his fellow countrymen to recognize the nobility of their courage and deaths for their country. Keiu Matsuo's deeds graciously were made known to the Emperor, and he was appointed Navy Commander with a special promotion of two ranks. He was granted medals of the Order of the Rising Sun 6th Class, Order of the Sacred Treasure 5th Class, and Order of the Golden Kite 4th Class. He was declared a war god (gunshin). 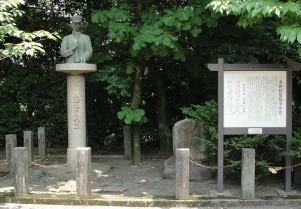 During his life he deeply revered Kikuchi Jinja and admired the spirit of loyalty of the Kikuchi Clan. He strove to inherit that spirit. He died in battle in awe-inspiring fashion during his sortie in which he was prepared to die. That is why this statue has been erected here. This statue was erected at the time of the visit to Australia by the Commander's mother to return her thanks for the kind treatment by the Australian government. It was erected through the generosity of persons who supported the trip and individuals who wanted to honor the memory of the Commander's exploits. The two tanka poems on the monument sign are 31-syllable poems with lines of 5-7-5-7-7 syllables. In the back of the information sign there is a stone monument that has engraved on front the same two poems by Commander Matsuo's father Tsuruhiko and mother Matsue. The back of the stone monument, which indicates it was erected in 1970, has a brief history of Commander Matsuo. 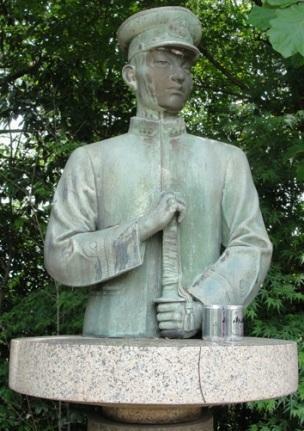 Another monument honoring Keiu Matsuo stands at the Matsuo family gravesite in nearby Yamaga City, Kumamoto Prefecture.